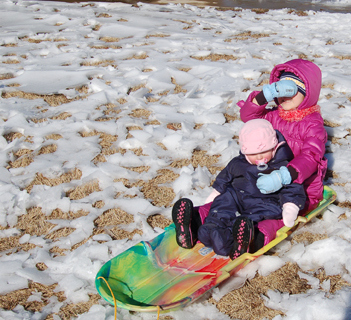 Sledding in Georgia was a little different than sledding in Michigan. The attire might be the same, but the conditions are very different. 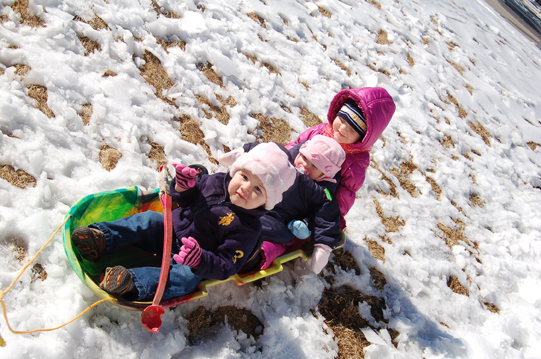 The temperatures were warming when we ventured out to go sledding, which can be seen in the photos below. It didn't matter, all three of the kids had fun. Mine being the most boring, just sitting in the sled, speechless, emotionless, content and at peace. It was so sunny, Avery had to cover her eyes to take this photo! Caleb joined in on the fun, and didn't leave the dog chuckit behind. While trying to get my kid to smile, Caleb got excited and Avery just couldn't handle all the sunlight in her eyes. 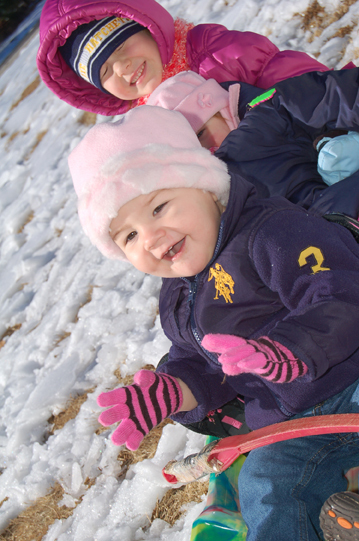 Note: Caleb didn't come over prepared to go sledding, so he had to borrow some of Avery's gloves and a hat. His mom does NOT normally dress him in pink accessories.